Drontal Promotion: Get 10% off Drontal Chews when you purchase any spot-on type flea product. 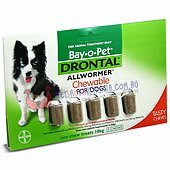 Simply add any spot-on type flea control product and any Drontal Chews product to your shopping basket and enter the coupon code "DRONTAL" into the coupon code box to receive your 10% discount off the Drontal Chews product. Click here to view our range of flea and tick products for dogs. Click here to view our range of flea and tick products for cats. For more information on how to enter a coupon code visit our frequently asked questions (FAQs) section.